Sugata Sanshiro is based off the classic Tsuneo Tomita's judo saga "Sugata Sanshiro." The story has been dramatized many times before, most famously in the 1943 Toho film that marked the directing debut of Akira Kurosawa. 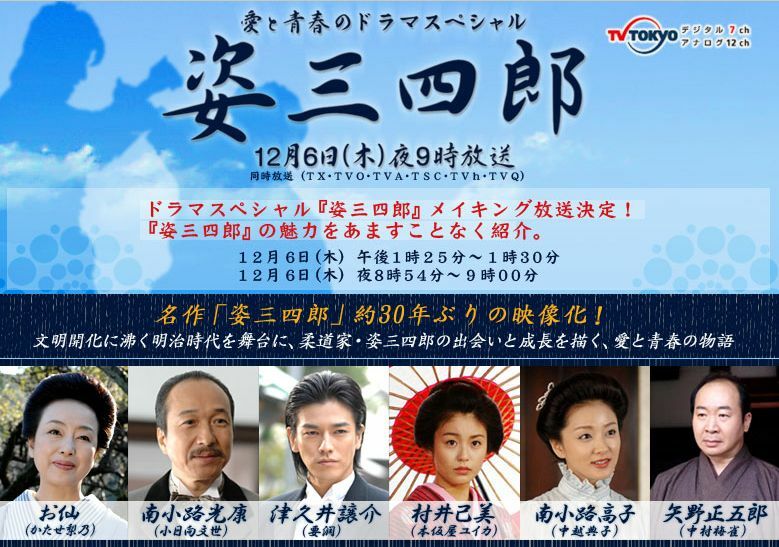 Shigeaki Kato plays the title role of a stubborn young man who travels from his hometown in Fukushima Prefecture to Tokyo in order to master the martial art of jujutsu during the early days of the Meiji Restoration. He ends up being one of the first disciples in jujutsu's offshoot called judo. Most of the drama revolves around Sanshiro's pure intentions and lack of guile, which always seems to land him in hot water. costa piperakis Aug 02 2014 4:40 pm I watched while i was on okinawa.and wish to see it again. costa piperakis Dec 20 2012 12:27 pm I am a practitioner of kodokan judo.I watched the t.v. version-in japan .I do wish some one would take on the task of translating the novel. costa piperakis Oct 23 2012 12:36 am I enjoyed the television in 1964.I only wish some knowledgeable author could translate the novel. costa piperakis Oct 23 2012 12:33 am I watched the television version in 1964.
costa piperakis Sep 10 2011 5:05 pm how can i get the latest version of sugata sanshiro?